It’s the start of a new year folks! We have all said ‘farewell to 2015’ and ‘hello to 2016,’ and likely everyone is working on their well thought out New Year’s resolutions. But, what about our four-legged friends? Improving your dog’s health, and life in general, should be just as much of a priority as improving your own. And you know what the beauty of that is? There are some changes that you can make to your daily routine that will help to improve both your health and your dog’s health simultaneously. Let’s talk about some ways that you can improve your dog’s health (and maybe even your own) in 2016! Schedule daily walks with your dog. Daily walks are a huge part of your dog’s life that greatly effects and benefits their health, and you know who else can benefit from going on daily walks? Daily walks are a great way to stimulate your dog mentally and physically, both of which are equally important to whole body health. It may be hard to believe, but your dog actually craves being on a daily schedule. Considering we are unable to communicate with our dogs with words, keeping them on a daily schedule actually provides them with a sense of security. Dogs are super smart and once they are put on a schedule, they know exactly and sometimes down to the minute, when to expect certain things. Again, do you know who else benefits from a daily schedule? You guessed it! Daily schedules can be beneficial for both you and your dog to help with consistency. 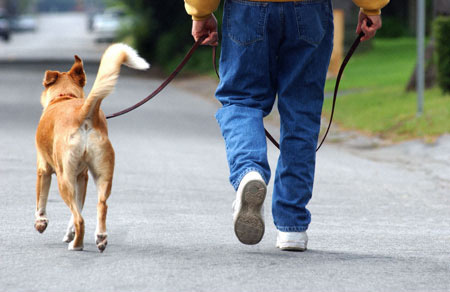 Start by waking up each day at the same time and immediately taking your dog out for a walk. You will be amazed to find that your dog will remember that morning walk, even when you forget and sleep in – Has anyone seen Max? Oh, he’s sitting by the door waiting to be taken out for his walk! Make necessary changes to your dog’s diet. Are you feeding your dog a complete and healthy diet that is formulated for their needs? There are so many dog food brands out there that aren’t designed with your pet’s best health in mind. A dog’s diet greatly effects the quality and longevity of their life. Choosing a food that is formulated with your dog’s health in mind will leave you rest assured that your dog is getting the most from their meals. Foods like Holistic Select, that are complete with probiotics and digestive enzymes to ensure maximum nutrient absorption for whole body health and regularity are a great choice for your dog. As always, consult with your veterinarian first before making any significant changes to your pet’s diet. Don’t forget to take your dog for their annual check-up at the veterinarian’s office. It is extremely important to keep up with your dog’s annual visits to the vet’s office. After all, the only way that you can improve your dog’s health is to know what needs to be improved. There are so many health issues that can go under the radar and can only be caught by certain tests performed by the vet at their annual health check. If you don’t already have your appointment for 2016, call your veterinarian today! Stimulate your dog’s brain with new activities. Mental stimulation plays a big role in keeping your dog healthy. A dog who lacks the proper amount of mental stimulation can become destructive – both to themselves and their owner. When a dog experiences a lack of mental stimulation, they can develop habits such as obsessive licking that can lead to hotspots as well as aggressive and destructive behavior, such as chewing on household items. Are you ready to start improving your dog’s health in 2016? We hope that these tips will help both you and your dog make the coming year your best one yet! Happy New Year, everyone!